Hello, my dear fellow dressmaker! 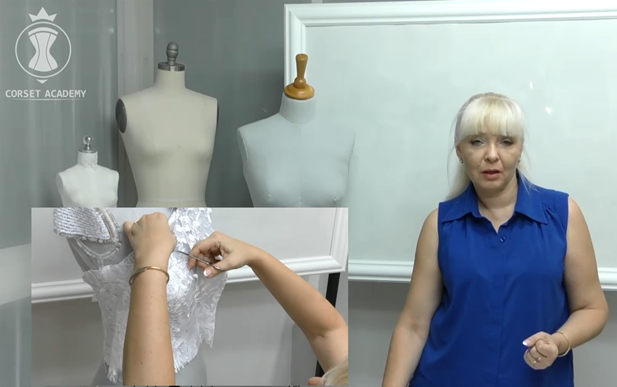 I am Tatiana Kozorovitsky and I am happy to welcome you at a new course from Corset Academy. 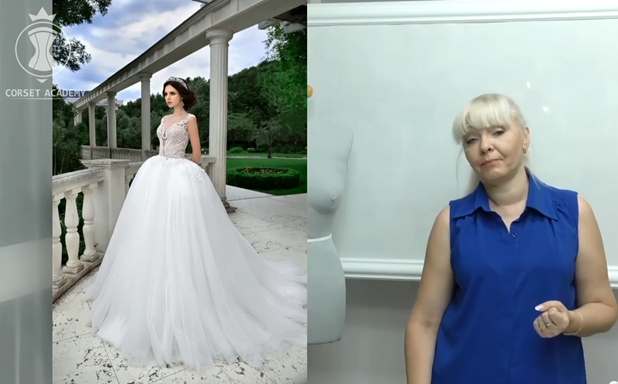 In this foreword I would like to present a dress model, over which we will be working together during the whole course. I thoroughly selected the model for the project and the process of dressmaking should answer many of your questions. The design of this model should be lightweight, comfortable and favorite of your clients. Looking at the image of the dress you probably cannot guess its internal design. This dress has a secret. I don’t want to keep you waiting and I am showing you the inside of a ready garment. Here we have cut-off cups, which are so favored by your clients recently. From the outside the dress looks as a single-piece dress. There is a lightweight and transparent build-in corset, which is made of fine mesh fabric. Corset is almost weightless and you can barely feel it on your body. There are plastic bones in casing, but they are neither Rigilene nor hard plastic bones. I will introduce new materials to you and how to use them. In this course I will also provide a completely new scheme of cup stitching. Together with the standard bones I will be using 0,6 mm and 1 cm wide non-standard Rigilene boning. This is the answer to your questions whether 8mm and 12 mm wide Rigiline bones can be used. Certainly, they can be used. I will demonstrate it to you. I will also show how to make a smooth, comfortable and lightweight inner side of a cup without wrinkles and ripples. Besides, the cup has also one secret, which could not be guessed when looking at the dress. You can find out about the secret only from the tutorials of this course. Why is the cup of my dress stitched and not foamy? Because this is a luxury dress! Everything should be at the highest dressmaking level. Foam cups have a lot of disadvantages and impose strict restrictions on your creativity. They are not suitable for every figure type and for every size of your customer. I offer you an option that suits both slim ladies and plus-sized ladies. Using the automatic calculation tables attached to the course, you can easily calculate pattern adjustment for any size. In certain tutorials of the course I will show how to alter the dress pattern for a girl with a bust circumference of 81 cm, this is the size of my model, to a customer with a bust circumference of 100 cm. Moreover, I will show changes in the pattern, both with one-piece cups and with cut-off cups. 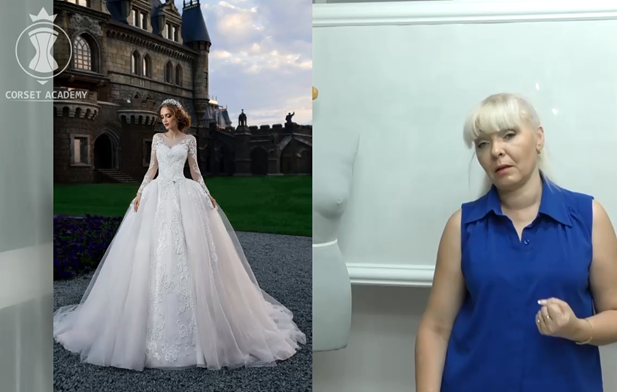 I will explain in detail the design peculiarities of the pattern and the assembly technique for our dress, when the face of the corset is solid, and the lining is with cut-off cups. Attention now! Do you agree when you look at an image or a video of a ready-made dress it is not obvious that it consists of two separate parts – a corset and a skirt? I know that often before a start to work on a garment in a photo, you question how to make a dress: as a single-piece or divide into a corset and a skirt. You cannot determine it just by looking at the dress as transition between a corset and a skirt is absolutely invisible. During this course you will see that a dress consisting of a corset and a skirt can look as a single-piece dress without seams and lines. About seams. I will show you a seamless corset cover with lacing. This technique is widely used in the fashion houses to create Haute-Couture dresses. By the way, the course is full of couture techniques. 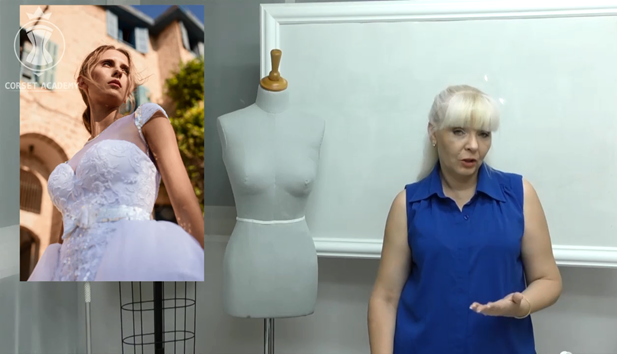 I will demonstrate how you can join a corset and a skirt, so that there is no any visible seam and how to join a lace folded skirt to a dress, so that you don’t have any extra thickness and the transition from a corset to a dress is smooth and invisible. I will tell in detail how to sew an elastic top between face and lining. The special feature of the course is tambour sequin embroidery. I intentionally call it tambour embroidery not Luneville. I understand your desire to learn such fashionable and popular embroidery! I will show you the techniques of tambour embroidery without using a Luneville hook. I will be using other alternative hook. Thanks to one technique that I will teach you, you can learn this embroidery within a day or two, understand the principle and begin to embroider confidently with beads and sequins. The main advantage of this tool is embroidery on face that allows seeing the created pattern. And the seam is a real tambour seam, which does not differ from embroidery made with the Luneville hook. I will give a brief overview of hooks for tambour embroidery. I will reveal all pros and cons of the Luneville hook, the Clover hook and a hook recommended in this course. Especially for this course, I picked up easy, but impressive embroidery. Even a beginner in embroidery can make it. I will demonstrate you embroidery on elastic top, belt and decorative bow. Certainly it will be accompanied with important comments and recommendations. The popularity of this model among brides is because it has almost all fashion trends: tender elastic top with embroidery, a built-in bra or cut-off cups, a tender silhouette of a lace dress, an open back and a short lacing on air loops. And a full detachable skirt with train. 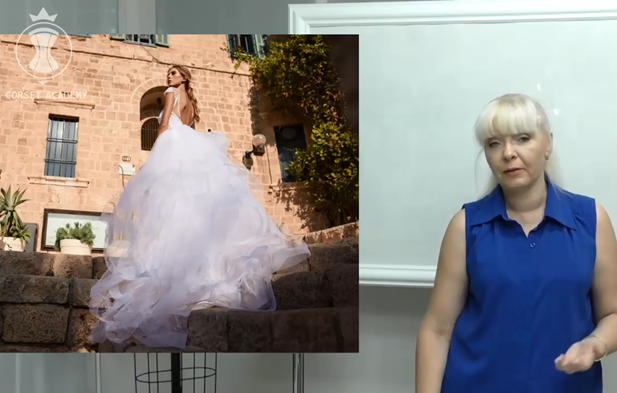 Only 14,5m of ordinary tulle was used to create this skirt. This is quite affordable! Nonetheless, the skirt looks expensive and chic due to decorative elements and techniques! The volume of the skirt is created by the stitched soft Rigilene and, of course, the three-dimensional padding at the waist is another highlight that I will tell you about. More and more often the questions arise about making a lightweight full skirt without crinoline. How to make the skirt full at the waist line just like as the ones in the photos? Many people already know that such fullness at waistline can be achieved with paddings. How to achieve the desired shape of a skirt and how to make a right pattern, so that everything turned out as planned from a first attempt. I will teach you a winning way to create the right shapes. From now on this mystery will be revealed to you. Difficulties will not arise either with the creation of a required fullness, nor with the creation of a correct pattern. As a special bonus to this course I added the tutorial where I explain how such paddings are created. Of course, it is not necessary for a detachable skirt to have such an additional padding. This is just an additional element underneath a skirt, but you can make without it. Everything depends on the requests of your customer. In order to draw your attention to this padding I have made it in the form of a bright decorative element, so that you can see in the images what is hidden under the skirt and creates its fullness in waistline. I intentionally wanted to highlight that in this course we will also review such a fashionable element in the design of a skirt. Therefore, I put this extra padding under the translucent fabric of a skirt so that it would be visible to anyone who wants to learn how to make such padding or a similar one. I also attached the automatic calculation tables not only for corset patterns, but also for a skirt of a dress. A crinoline is not used for this dress, but I am sure one day you will need to make a model where crinoline with ruffles of without them is used. Therefore, I prepared another bonus tutorial in the course, where I demonstrate how the automatic calculation tables can be used. The tables are also attached to this course and you can instantly calculate the pattern of a dress crinoline and its ruffles. Finally, I am pretty familiar with the situation when you start making your dress and the issue to purchase all necessary materials occurs. Thus, I attached a file with links to the online shops, where I purchased tools and materials demonstrated and used for the dress making and they can be handy in the future. I provide information where you can buy fusible interfacing for cups and face of the corset and tambour embroidery hook and so on. I hope I have proved there are very useful tutorials and bonuses in this course. Enjoy.